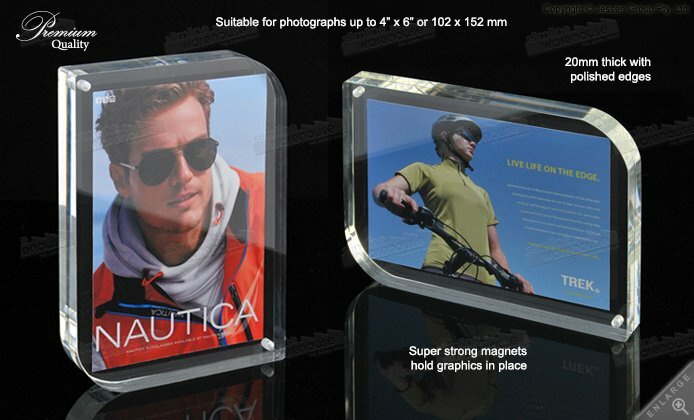 The Acrylic Block Frame Features Button Magnets Holding the Display Securely Together. 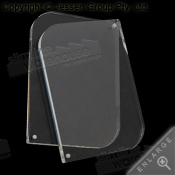 Acrylic block frame holds a 4" x 6" (102 x 152mm) graphic in landscape or portrait format! This acrylic block frame makes a favorable impression at any location it is placed in. 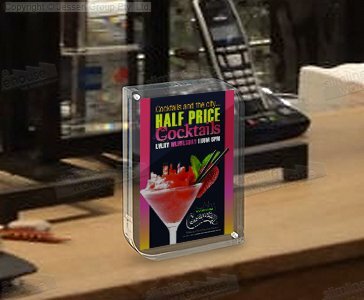 This photo display is premium quality, offering the visual appeal of glass but with more durability and a lower cost! This magnetic signage holder is perfect for placing advertisements, menus, or announcements in retail stores, information centres, exhibition halls, restaurants, cafes, doctor offices, and more! 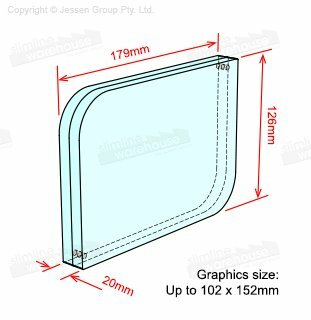 The plastic photo holder, acrylic block frame is made to display 4" x 6" (102 x 152mm) graphics in landscape or portrait format. You can also place two graphics back to back for a dual-sided display! The floating appearance of the design design of these frames provides an attractive look that helps to draw passersby attention when placed around your business. 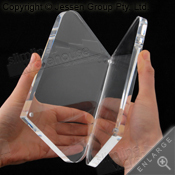 The 20mm thick clear plastic is premium quality, giving a stylish look that works well within any décor. When combined with the curved accents & polished edges on the magnetic picture holder, you get a truly eye-catching stand! There are magnets embedded within the plastic that tightly keep the frame together. Switching graphics is easy as well, with no tools required for switching out your posters in less than one minute! The magnetic frames offer a great alternative to glass displays that are most costly and less durable. A wide range of different styles & sizes are available for you to peruse in order to find the best item for use at your business! Check out our vast online catalogue to see the hundreds of different items we currently have available for your company to use to outfit your location. In addition to our low prices & high-quality items, Slimline Warehouse also provides same day despatch with most in stock items to Brisbane, Adelaide, Cairns, Gold Coast, Melbourne, Sydney, Perth, & anywhere else in Australia when purchased by 1pm EST!